Greetings from the ranch home of Rocky Mountain Rawhide Bulldogges and Powder Valley Poodles. I wish to thank all of the participants in this year’s Bow Wow Pow Wow! We had a couple of dozen dogs come by for pictures and it was great. I also with to thank my Three Amigas, Carol, Dorothy and Sue, for all the work of calling several hundred people in order to get the couple of dozen here for that day. Thank you! White bulldogs from Rocky Mountain Rawhide. Photo Above: Three varieties of our bulldogs showed up at our semi-annual Rocky Mountain Rawhide Bow Wow Pow Wow. A fun time was had by all! Although we do produce bulldogs with color, this white-coated group seemed very happy to pose together for a striking picture. Since this newsletter is for both Rocky Mountain Rawhide Bulldogges AND Powder Valley Poodles, everyone gets to hear about our new endeavor of breeding Miniature Goldendoodles. WHY? Because we can! And because everyone keeps asking us too, that’s why! They love our poodles but want miniature golden doodles that are as high a quality dog as our poodles, at a price the average family can afford. We had so much response to our standard sized goldendoodles that we want to offer the minis as well. People were very thankful that they didn’t have to pay thousands of dollars to get a quality goldendoodle. We agree that the cost of goldendoodles out there is pretty outrageous. It isn’t like the breeders are breeding show dogs from years of show dogs, come on! People are greedy. That is why goldendoodles are so expensive. Our minidoodles will cost a little more than the standard Doodles because Pixie can only produce a few at a time, but thousands of dollars? I don’t think so! Look for little Pixiedoodles to be born in Feb. or March of 2013. The American Kennel Club has reversed its decision on awarding titles to dogs passing The AKC Canine Good Citizen tests. This means that from now on, any AKC registered dog who passes the AKC Canine Good Citizen test can have the title of Canine Good Citizen on its registration papers. Dogs who have previously passed the test can be “grandfathered” in. Congratulations to all the people out there who now have AKC titled dogs and didn’t even know it! Go to AKC.org for more info. That’s all for now. Next update we’ll have info on all the litters coming up. We will also set up a date for our training clients to have their own Bow Wow Pow Wow. And, for this summer’s Level Three class to have their sheep herding day. I have not forgotten you! Stay tuned! I’m back to writing a monthly newsletter. A lot has happened since my last newsletter which, I believe, was in 2007. I was hoping that since starting a Facebook account that I would just do the whole Facebook thing. But, I’ve learned I can’t really do Facebook because I get stuck there. I find that the “few minutes” I’m on Facebook has somehow turned into two hours and I’m running late on everything I’m supposed to be doing. So, I’ll leave Facebook for when I have mega tons of time and do a monthly newsletter instead. This newsletter will cover everything that going on in my professional life. In it, you should be able to hear about recent births, pending litters and breedings, genetic test results and where our puppies were placed.. Also, dog training classes, pictures I like and some questions and answers from clients. So! With that in mind, here’s all the news for September! WE HAVE A NEW WEB SITE! Have you noticed? Designed by my friend Bonnie Story from Story Board Productions, this new web site should bring new people into our Rocky Mountain Rawhide fold. In the mean time — Punkin had her very last litter. Two girls, Lilac and Lily, were born on August 28th., 2012. Punkin does not do labor easily. So, we had a “C” section performed and because she is 6 years-old, had her spayed at the same time in order to avoid another surgery. Both mama and babies are doing well. We will most likely keep one of the babies as we have NEVER had a bulldogge give us prettier babies than Punkin. I’m hoping whichever puppy we keep will continue the tradition. Bow Wow Pow Wow date set! Our “Bow Wow Pow Wow”, an open house for all of our puppies and Level Three and higher dog obedience clients can bring their dogs for a fun few hours at the ranch is set for Sunday October 7th from 11:00am to 2:00pm. We will have games, prizes, door prizes and opportunities to meet the parent dogs of your puppies and have a great time with your pooch! 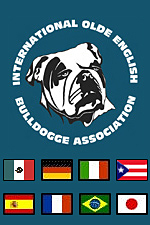 Both bulldogges and poodles are encouraged to attend along with my Level Three class participants who wish to bring their dogs. I would LOVE to see everyone! Because this is October in Colorado, (we had to do it when it will be cool so the bulldogges won’t get over heated ), we have to keep in mind that weather may not be cooperative. If it looks iffy, call ahead at 970-568-7585 to make sure we don’t have to cancel because of wind, rain or wet snow. Although this is an open house, we will have scheduled events. Look to October’s newsletter to find out which activities are scheduled and when. Powder Valley Poodles, Fort Collins Dog Training, and Terry Jester.Com are also going to be launched soon. My goal is to have everything done by the new year. Terry Jester.com will be a new site highlighting my writing. Viewers will be able to read my Coloradoan columns and download my books. Didn’t know I had books? Yes! Most are out of print, but by making them accessible as “E- Books” I won’t have to worry about making sure I always have enough copies for those who want them. In the works is an E-book on training stubborn dogs. That’s it for now. Remember, we love to hear from people who have our puppies, we like pictures and will post your pup or dog in “Testimonials” if you would like! Just send us an email, we’ll do the rest.